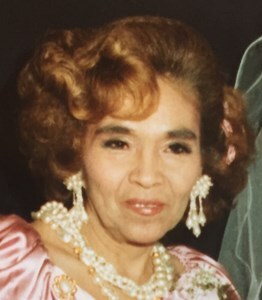 Newcomer Family Obituaries - Victoria B. Santellana 1929 - 2019 - Newcomer Cremations, Funerals & Receptions. Heaven has a new angel and her name was Vickie Briseno Santellana. She was born on March 10, 1929 in San Antonio, Texas. Her father, Bruno Briseno was a civilian employee at Lackland Air Force base and her mother, Trini Contreras was a home maker. She had an older sister, Catarina. Both her parents instilled a love of family and hard work. When she was 8 years old, she lost her Mother and several years later she lost her older sister. The loss of her Mother and Sister changed her life forever. She was raised by her widowed father and paternal grandmother. She grew close to her male cousins who taught her to chase chickens, play jacks and shoot guns. She loved the bonnie bluebells of the Texas prairies and often told us stories of being raised deep in the heart of Texas. She met her husband, Tony Santellana at the young age of 15 and dated the 17 year old on a dare. A month later they were married and remained so for the next 73 years. She followed her young husband to El Paso, Texas where he was stationed in the Army during WWII and that is where their son, Jesse was born. After the war, they joined his family as they moved up North to find work. They settled in Toledo, Ohio and raised their family there. She always loved large families and in time they were blessed with 8 children of their own. She is survived by sons, Jesse and Joseph, Daughters, Mary Frank, Rosita Hodges, Lucy Zion, Linda Duell, Vicki Young, and Tina Martinez. Through the years Vickie worked at raising her family and instilled her love of God first and family second. She and Tony were well known in the Latin community. They organized baseball teams and dances. Eventually they went into business together when they owned and operated Tony & Vickie’s Cabaret in East Toledo. Many were fed, stories listened to and a stage was there to welcome young musicians who yearned to perform. Her daughter, Tina Martinez performed often with her husband, Don. It was a gathering place for the Latin community as well as a place for the family Easter brunch and egg hunts for the grandchildren. She had no time for gossip or negativity. She loved the Kennedy’s and Elvis. She loved boots, black leather pants and hats. She loved high heels and manicures. She loved to travel and after retirement would visit family in Texas, North Carolina, Nevada and California. Her style was her own. Her laughter was infectious. She loved books and animals. She instilled higher education and fairness. She loved the law and politics. She spoke up for herself and for those she loved whenever she felt someone was being treated unfairly. She attended Mass regularly at Rosary Cathedral and was in attendance for weddings, baptisms and Holy Communion for her children and grandchildren. Her faith in God was unshakeable. She did not want to leave this world as she was fascinated with life and people. She leaves behind her husband of 73 years, 8 children, including son-in-laws, grandchildren and great grandchildren. She also leaves behind her niece, Ninfa Garcia. Our Mother, the Matriarch of our family is gone but never forgotten. She was called Home on February 5, 2019. Heaven has a new angel and her name was Vickie Briseno Santellana. The family will receive guests Sunday, February 10, 2019 from 2:00 p.m. - 8:00 p.m. at Newcomer – West Sylvania Chapel, 3655 King Road, Toledo (419-392-9500), where a Scripture Service will be held at 7:00 p.m.. The Funeral Mass will be held Monday, February 11, 2019 at 12:00 p.m. at Our Lady Queen of the Most Holy Rosary Cathedral. Burial will follow at Toledo Memorial Park Cemetery. To leave a special message for Vickie's family, please click on the share memories tab above. Add your memories to the guest book of Victoria Santellana. Vicki will cumbia all the way to heaven.. My sympathy to the family and may she Rest in eternal peace. I loved her from the first time I met her in 1993 I thought she was so kind and sweet she accepted me almost immediately months later I asked her if I could call her mom! I held my breath when she said to me of course mija! I didn't know what that meant so I asked Jesse and he said it meant daughter. I was so happy in the later years she said she loved me. I thank God I got to know her and to be part of her beautiful family. I remember Vickie and Tony back in the 80'S. Spend alot of times there. Lovely and kind people. The obituary describes her to a T. Love this lady. R.I.P. My condolences to the family and her husband. She was beautiful inside and out. Her smile was sincere, just as her love of God and family. May your wonderful memories comfort you in the days to come. While we knew Mom was ill, her loss is devastating. She was such a special lady and I am so thankful that she was my Mother. She taught us to be genuine and kind. She gave of herself to family, friends and strangers. Her joy in her faith in God was her gift to us. I remember seeing Vickie and Tony many times dining in the community when my wife and I went to dinner. She was quiet and unassuming with a beautiful smile. Her mannerisms were elegant and her beauty was radiant. May God bless and keep the family through these difficult times.